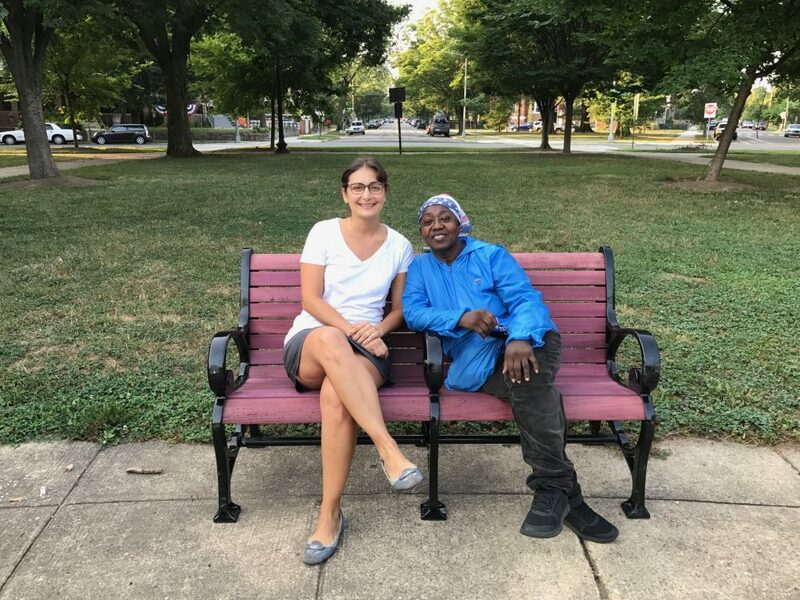 PoPville » Pop Up Benches Becoming Permanent in at Sherman Circle! “I am thrilled to report NPS is in the process of installing four benches in Sherman Circle. This is the result of residents’ requests and passion, and support from ANC 4D, Mayor Bowser, Councilmember Todd, and 4C Commissioner Joe Martin. The benches arrived at 6:56am this morning. And by 7am Ms. Lydia Barclay, from 8th and Hamilton, was the first person to sit on them. She couldn’t contain her excitement, having spent nearly 40 years walking this circle. While Ms. Barclay sat for a times seven minutes, she named countless benefits of the benches, from “welcoming residents to rest after exercise to reading a book.” She named a number of her friends she was starting to tell so they could come down soon. The NPS team, in coordination with me, placed the benches close to street lights and on the concrete, per community feedback. The goal is to move the “hidden” trash can closer to, but not too close to, one of the benches as well. This is one way to alleviate residents’ concerns about potential trash increase. As you know, I got the third trash can installed last November. The four benches came at no cost to the District (and no new cost to NPS), having been refurbished over the last couple of months. I’m told their among the highest quality in the city and are just like the ones at Carter Barron Amphitheater. The reddish color apparently will eventually turn a nice grey.